There are big changes taking shape at Enterprise Products Partners. That's less desirable in the near term but great for the long term. 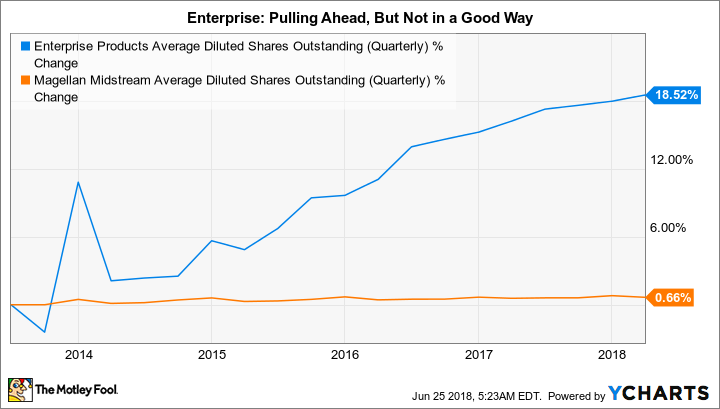 Enterprise Products Partners LP (NYSE:EPD) offers investors a robust 6.1% yield backed by 21 years of consecutive annual distribution increases. That said, it's in the middle of a business overhaul that will likely lead to distribution growth that will hover in the low single digits in 2018 (and perhaps longer). For long-term income investors, however, this high-yield stock has a huge amount of potential. Here's what you need to know so you don't miss the opportunity ahead at Enterprise Products Partners. One of the first things you need to understand about Enterprise is the partnership's truly massive scale. At a $60 billion market cap, it is among the largest and most diversified midstream players in North America. It participates in the pipeline, storage, processing, and port segments of the industry with largely fee-based assets. Notably, Enterprise is well-positioned to benefit as U.S. energy production expands and increasingly flows across the globe. The midstream partnership's large size is a limiting factor, because it means that big projects are needed to move the needle on the top and bottom lines. However, it has the scale to take on such projects and a track record that proves it is capable of executing. For example, over the past five years, it brought $17 billion worth of capital projects online without any notable problems. Over that same span it also consummated roughly $8 billion worth of acquisitions without any material execution issues. Enterprise is a well-run partnership, full stop. The only potential problem for investors has been Enterprise's funding choices. Partnerships are designed to pass cash on to unitholders, leaving little money for capital investments. That means that capital spending is often funded by issuing debt, potentially increasing leverage, or new units, which dilutes current unitholders. The latter is the key issue right now. Over the past five years the partnership's unit count has increased by nearly 20%. For comparison, Magellan Midstream Partners, LP (NYSE:MMP) has effectively issued no new units over the same span while still managing to expand its business with sizable capital projects. This is one of the reasons why investors have rewarded Magellan with a price to tangible book value of roughly 7.8 times while Enterprise's valuation is only around 4.5 times. The opportunity here is that Enterprise is working to become more like Magellan. Magellan has avoided issuing shares by directing more of its internally generated cash flow toward capital spending. That, in turn, limits its need to issue dilutive new units. That's not to suggest that Magellan never issues units, -- for the right project or acquisition it certainly would do so if needed. But management has proven to be very judicious in its use of this funding source. Enterprise announced in 2017 that it is shifting gears so that it, too, is self-funding more of its own growth. The goal is for the partnership to use retained distributable cash flow to self-fund 50% of its $3 billion in capital spending plans for 2019, a 70% increase over the self-funding levels it achieved in 2017. As Enterprise's business model shifts more toward that of Magellan's, I expect investors to reward the effort with a higher valuation -- effectively narrowing the gap in price to tangible book value with Magellan. The problem is getting from here to there. After years of mid-to-high single-digit distribution hikes, Enterprise is projecting distribution growth that will hover in the low single digits. The distribution was just 3% higher year over year in the first quarter. That's not what investors have come to expect and definitely not an exciting outlook. Magellan, for reference, is projecting distribution growth of as much as 8% a year through 2020. Effectively, the cash Enterprise isn't putting toward growing the distribution is being used to meet its self-funding goals. Enterprise's self-funding goals appear achievable and will make the partnership a better business. Image source: Enterprise Products Partners LP. Enterprise could quickly find cash by cutting the distribution, but that's a truly undesirable choice for investors. Instead, management has chosen to limit distribution growth for a little while to allow the new cash flow from the roughly $5 billion in existing growth projects it has planned in 2018 and 2019 to increase the cash available to use for self-funding. It's a transition period that will take a year or so to get through, but once Enterprise has shifted gears, it should be able to increase its distribution growth back into a more historically normal range -- and on a sustained basis. In other words, once Enterprise has gotten through this period of slow distribution growth, it should be business as usual for the distribution, only the partnership will have shifted to a more Magellan-like funding model. Yes, the next year or two could be less rewarding than in the past when it comes to distribution growth. But if you can think long-term, the change that is being made is huge and very investor-friendly. Moreover, it will likely lead to a shift in the way investors value Enterprise's units. The cost is collecting a high yield with just modest distribution growth prospects for a short period of time. That sounds like a worthwhile trade-off.